Jungle party supplies are more than just paper plates and matching napkins. In fact I like to spend my party money on the things kids think are fun - from the decorations to games to take home party favors. 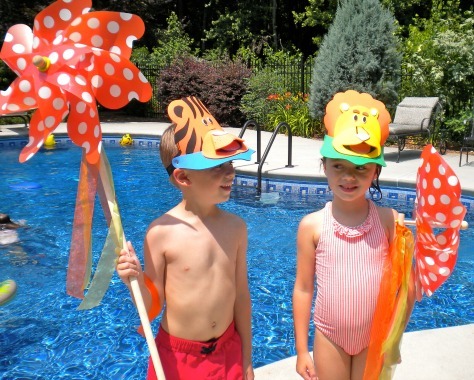 Kids from ages 2-7 wore these colorful foam jungle animal visors at our jungle pool party. We used them to decorate the tables, for pool party games and then as take home party favors. Very durable and sturdy it doesn't matter if the foam visors get wet. Come up with party theme colors - like dark brown and lime green and repeat the colors in your invites, paper goods and party bags. You don't need fancy jungle printed napkins and plates - simply use solid lime green or brown plates and napkins. This inflatable zebra will be the hit of the party. I love large things to make a large impact in a large area like a swimming pool. This guy is easy to inflate with an electric pump. At 32" high and only $12 you may want more than one. Use him for photo ops and then let him get wet and join the kids in the pool. Hide inexpensive snakes among the shrubs around the perimeter of the swimming pool. Purchase enough so that there is at least one snake per guest. 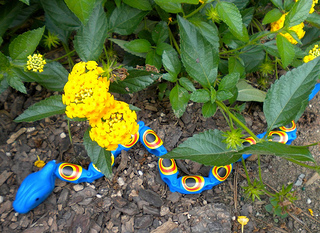 We bought these wiggle snakes and used them on the party tables as well as hiding them in the bushes. Tell the kids they are going on a snake hunt and that they each get to keep 1, 2, or more snakes. Depending of course on the age of the swimmers, buy two jungle themed swim rings like this hippo. Use them for games or for party props. I've seen these split swim rings come as hippos, monkeys, and giraffes. One at a time a team member swims the width of the pool and back wearing the hippo ring and gives it to the next team member. Is he not the cutest little giraffe? I found very inexpensive animal print party bags at Amazon. This set of 12 goody bags is less than $5 at Amazon. They are about the size of a lunch bag. 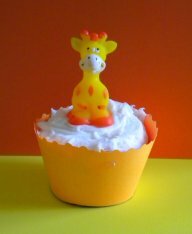 Jungle party favors can be found at - my favorite store, the Dollar Store or in the dollar section at Target. It's also easy to find jungle party theme favors on line at Oriental Trading. These jungle animal beach balls can be used as party decorations and then let the kids pick one out to take home. Snakes, finger puppets, foam visors and animal crackers were all a big hit at our kids pool party this summer. Provide animal print sunglasses when kids arrive for a great photo op or put them in their party bags to take home. At just .50 a piece they are an inexpensive party favor. 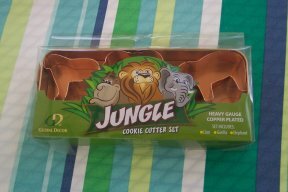 These jungle cookie cutters can be used to make your own jungle themed cookies or for sandwich cutouts. I am not one who likes to roll out cookies, but I did use them to cut out sandwiches shaped like lions and elephants. As you can see your themed party supplies are lots more than plates and cups. 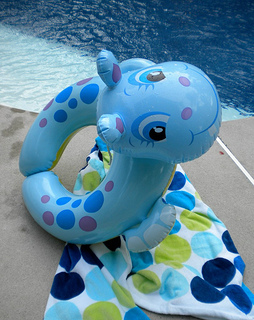 Kids especially love the inflatables, the tattoos, and plastic safari animals that can be played with in the pool.